Our Membership Advisory Group conference calls connect you with peers in similar situations, facing similar challenges. It's a place to share ideas, work on strategies, contribute best practices or just listen-in. Next week, we’re getting the group together to talk about “Best Practices for Welcoming New Members”. How are you currently welcoming new members into your organization? Do you make them feel included? The way you welcome new members into your community can make or break an experience and play a big role in determining if members renew or volunteer. So, for this discussion we want to hear what you are currently doing to welcome new members at your organization and discuss best practices and brainstorm ideas for getting new members more involved with your organization. What are your processes for welcoming new members to your club or association? How do you inspire new members to volunteer and get involved? How are your retention and renewal rates? What is working or not working in your opinion? What is the feedback you receive from new members? How or do you collect feedback from new members? 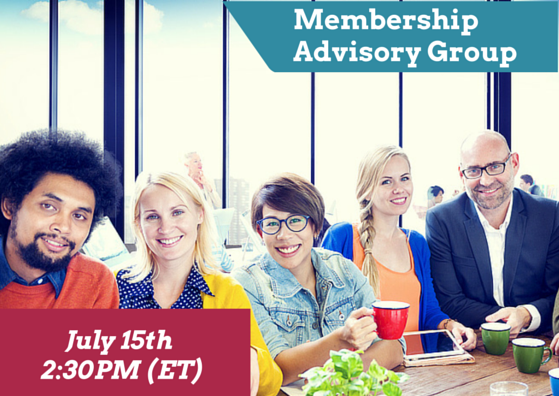 Sign up to be a part the Advisory Group and join the call on July 15th.